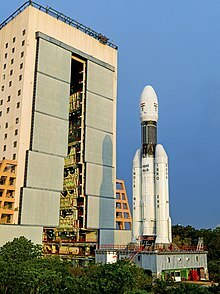 The Geosynchronous Satellite Launch Vehicle Mark III (GSLV-III), also referred to as the Launch Vehicle Mark 3 (LVM3) is a three-stage medium-lift launch vehicle developed by the Indian Space Research Organisation (ISRO). It is designed to launch satellites into geostationary orbit, and is intended as a launch vehicle for crewed missions under the Indian Human Spaceflight Programme. The GSLV-III has a higher payload capacity than the similarly named GSLV. After several delays and a sub-orbital test flight on 18 December 2014, ISRO successfully conducted the first orbital test launch of GSLV-III on 5 June 2017 from the Satish Dhawan Space Centre, Andhra Pradesh. In June 2018, the Union Cabinet approved ₹4,338 crore (US$600 million) to build 10 GSLV Mk-III rockets over a five-year period. On 15 August 2018, Indian Prime Minister Narendra Modi announced in his Independence Day speech an Indian foray into human spaceflight in 2022 with the aim of sending a crewed spacecraft called Gaganyaan to low Earth orbit. The GSLV Mk III will be the launch vehicle for this mission. Geosynchronous Satellite Launch Vehicle Mark III D1 lift off. ISRO initially planned two launcher families, the Polar Satellite Launch Vehicle for low Earth orbit and polar launches and the larger Geosynchronous Satellite Launch Vehicle for payloads to geostationary transfer orbit (GTO). The vehicle was reconceptualised as a more powerful launcher as the ISRO mandate changed. This increase in size allowed the launch of heavier communication and multipurpose satellites, future interplanetary exploration and will be human rated to launch crewed missions. Development of the GSLV-III began in the early 2000s, with the first launch planned for 2009–2010. The unsuccessful launch of GSLV D3, due to a failure in the cryogenic upper stage, delayed the GSLV-III development program. The GSLV-III, while sharing a name with the GSLV, it features different systems and components. The first static fire test of the S-200 solid rocket booster, ST-01, was conducted on 24 January 2010. The booster fired for 130 seconds and had nominal performance. It generated a peak thrust of about 500 metric tons (1,100,000 lb). A second static fire test, ST-02, was conducted on 4 September 2011. The booster fired for 140 seconds and had nominal performance. A third test, ST-03, was conducted on 14 June 2015 to validate the changes from the sub-orbital test flight data. ISRO conducted the first static test of the L110 core stage at its Liquid Propulsion Systems Centre (LPSC) test facility at Mahendragiri, Tamil Nadu on 5 March 2010. The test was planned to last 200 seconds, but was terminated at 150 seconds after a leakage in a control system was detected. A second static fire test for the full duration was conducted on 8 September 2010. The first static fire test of the C25 cryogenic stage was conducted on 25 January 2017 at the ISRO Propulsion Complex (IPRC) facility at Mahendragiri, Tamil Nadu. The stage was tested for a duration of 50 seconds and had nominal performance. A second static fire test for the full in-flight duration of 640 seconds was completed on 17 February 2017. This test demonstrated the repeatability of the engine performance along with its sub-systems, including the thrust chamber, gas generator, turbo pumps and control components for the full duration. All of the engine parameters had nominal performance. After the suborbital test flight of GSLV-III, modifications were made to the vehicle to improve performance. The propellant grain geometry of head end segment was changed to a 13-lobed star configuration from a 10-lobed slotted configuration and propellant load was reduced to 205 metric tons (452,000 lb) to improve performance during transsonic flights. The payload fairing was modified to an ogive shape, and the S200 booster nosecones were slanted to improve aerodynamic performance. The inter-tank structure of the C25 cryogenic stage was redesigned for density. The first stage consists of two S200 solid motors, also known as Large Solid Boosters (LSB) attached to the core stage. Each booster is 3.2 metres (10 ft) wide, 25 metres (82 ft) long, and carries 207 metric tons (456,000 lb) tonnes of propellant. The S200 booster uses an HTPB based propellant. It is the largest solid-fuel booster after the Space Shuttle SRBs and Ariane 5 SRBs. The flex nozzles can be vectored using electro-hydraulic actuators and are used for vehicle control during the initial ascent phase. These boosters burn for 130 seconds and produce an average thrust of 3,578.2 kilonewtons (804,400 lbf) and a peak thrust of 5,150 kilonewtons (1,160,000 lbf) each. 4). It is powered by two Vikas 2 engines, each generating 766 kilonewtons (172,000 lbf) thrust, giving a total thrust of 1,532 kilonewtons (344,000 lbf). The L110 is the first Indian clustered liquid-fueled engine. The Vikas engines uses regenerative cooling, providing improved weight and specific impulse compared to earlier Indian rockets. Each Vikas engine can be individually gimbaled to control vehicle pitch, yaw and roll control. The L110 core stage ignites 114 seconds after liftoff and burns for 203 seconds. The cryogenic upper stage, designated C25, is 4 metres (13 ft) in diameter and 13.5 metres (44 ft) long, and contains 28 metric tons (62,000 lb) of propellant LOX and LH2. It is powered by the CE-20 engine, producing 200 kN (45,000 lbf) of thrust. CE-20 is the first cryogenic engine developed by India which uses a gas generator, as compared to the staged combustion engines used in GSLV. The payload fairing has a diameter of 5 metres (16 ft) and a payload volume of 110 cubic metres (3,900 cu ft). There is a proposal to replace L110 core stage in GSLV Mk III with a kerolox stage powered by SCE-200 to increase its payload capacity to 6 metric tons (13,000 lb) to GTO. Propellant load on hydrolox upper stage will be increased to 30 tonnes from 25 tonnes. The first flight of the upgraded GSLV Mk III is expected in December 2020 but not for the crewed Gaganyaan spacecraft. The maiden flight of the GSLV-III occurred on 18 December 2014. The flight lifted off from the Second Launch Pad, at 04:00 UTC. The test had functional boosters, a core stage and a non-functional dummy upper stage. It carried the Crew Module Atmospheric Re-entry Experiment (CARE) that was tested on re-entry. Just over five minutes into the flight, the rocket ejected CARE at an altitude of 126 kilometres (78 mi), which then descended, controlled by its on-board motors. During the test CARE’s heat shield experienced a maximum temperature of around 1,000 °C (1,830 °F). ISRO downloaded launch telemetry during the ballistic coasting phase prior to the radio black-out to avoid data loss in the event of a splash-down failure. At an altitude of around 15 kilometres (9.3 mi), the module’s apex cover separated and the parachutes were deployed. CARE splashed down in the Bay of Bengal near the Andaman and Nicobar Islands and was recovered successfully. The first orbital flight of the GSLV-III occurred on 5 June 2017, lifting off from the Second Launch Pad at 11:58 UTC. The vehicle carried the GSAT-19 communication satellite, making it the heaviest Indian rocket and payload ever launched. The satellite was successfully placed into a geostationary transfer orbit (GTO) at 170 kilometres (110 mi). The flight also tested upgrades to the design from data acquired during the sub-orbital test flight (See section on redesigns). Second orbital test flight. L110 core used upgraded Vikas engines with higher thrust. Flight M01. Chandrayaan-2 is India's second lunar exploration mission, with a mass of 3,877 kg (8,547 lb). First operational Flight of GSLV MK-III. Launch mass is 7,800 kg with service module, capsule's mass is 3,735 kg. Launch mass is 2,500 kg; Venus orbiter and atmospheric balloon. ^ a b c d e f g h i j "GSLV Mk III". Indian Space Research Organisation. Retrieved 20 September 2018. ^ "Historic Day, Says ISRO As India's 'Baahubali' Rocket Lifts Off: 10 Facts". NDTV. Retrieved 30 May 2018. ^ Narasimhan, T. E. (5 June 2017). "'Fat Boy' GSLV-MK III launches today: The rocket has cost India Rs 400 cr". Business Standard. Retrieved 30 May 2018. ^ a b "The first developmental flight of GSLV-Mk-III". Indian Space Research Organisation. Retrieved 30 May 2018. ^ a b c d e f g h i j k l m n o "LVM3". Retrieved 21 December 2014. ^ a b "ISRO Press Release: S200 First Static Test (S-200-ST-01)" (PDF). Archived from the original (PDF) on 11 March 2013. Retrieved 17 June 2017. ^ a b "Isro successfully tests world's 3rd largest solid booster". dna. Retrieved 4 October 2014. ^ "India to test world's third largest solid rocket booster". Science and Technology Section. The Hindu News Paper. 7 December 2009. Retrieved 7 December 2009. ^ a b c d e f g "GSLV Mark III-D1 / GSAT-19 Brochure". IRSO. ^ a b "GSLV Mk3". Space Launch Report. Retrieved 23 October 2014. ^ a b c "L110 test to follow S200". IndianSpaceWeb. Retrieved 15 October 2014. ^ a b "As it happened: ISRO successfully launches GSLV Mark-III". The Hindu. 17 December 2014. ISSN 0971-751X. Retrieved 30 May 2018. ^ "'India masters rocket science': Here's why the new ISRO launch is special". ^ "Two international astronauts survive space scare. How well is India prepared?". ^ "Indian Space Research Organisation preparing for three more PSLV launches". The Hindu. 29 April 2011. ISSN 0971-751X. Retrieved 30 May 2018. ^ Ramachandran, R. (22 January 2014). "GSLV MkIII, the next milestone". Frontline. Retrieved 30 May 2018. ^ Sengupta, Rudraneil (5 June 2017). "Cryogenic rocket engine has been developed from scratch: Isro chief". LiveMint. Retrieved 30 May 2018. ^ "India launches 'monster' rocket". BBC News. 5 June 2017. Retrieved 30 May 2018. ^ "India's 'Bahubali' GSLV Mk III lifts less luggage than lighter rockets". The Economic Times. 16 June 2017. Archived from the original on 18 June 2017. ^ "Government approves Rs 10,000-crore continuation programmes for PSLV, GSLV". The Economic Times. 7 June 2018. Retrieved 8 June 2018. ^ Kumar, Chetan (15 August 2018). "India to launch first manned space mission by 2022: PM Modi - Times of India". The Times of India. ^ "Gaganyan: How to send an Indian into space". ^ "ISRO is developing the technologies necessary for an indigenous human spaceflight programme". Tech2. First Post. Retrieved 30 May 2018. ^ ISRO Not To Fly Living Being Before Actual Manned Space Mission: Official. NDTV Indo-Asian News Service. September 14, 2018. ^ a b "India's GSLV Mk-3 First Flight Pushed Back to April 2014". Sawfnews. 4 April 2013. Archived from the original on 10 April 2013. Retrieved 19 December 2014. ^ "Successful static testing of Solid Propellant Booster Rocket Stage S200 for GSLV Mk III Launch Vehicle". www.isro.gov.in. Retrieved 12 February 2018. ^ "Second Static Testing of Solid Propellant Booster Rocket Stage S200 for GSLV-Mk III Successfully Conducted". VSSC.gov.in. Archived from the original on 12 February 2018. Retrieved 12 February 2018. ^ "విజయవంతంగా భూస్థిర పరీక్ష". Sakshi. 15 June 2015. Retrieved 12 February 2018. ^ Reporter, Staff (15 June 2015). "Static test of S200 motor successful". The Hindu. ISSN 0971-751X. Retrieved 12 February 2018. ^ "ISRO successfully conducts static testing of new age rocket". The Hindu. Retrieved 4 October 2014. ^ "ISRO Press Release:Successful Static Testing of L 110 Liquid Core Stage of GSLV - Mk III". Archived from the original on 2 February 2014. Retrieved 17 June 2017. ^ "ISRO Successfully Tests C25 Cryogenic Upper Stage of GSLV MkIII". Indian Space Research Organisation. Retrieved 30 May 2018. ^ a b "ISRO Successfully Tests its Cryogenic Stage (C25) for GSLV MkIII for the Flight Duration". Indian Space Research Organisation. Retrieved 17 June 2017. ^ a b Department of Space, Government of India. "Outcome Budget 2016-17" (PDF). isro.gov.in. Department of Space, Government of India. Archived from the original (PDF) on 26 November 2016. Retrieved 1 June 2017. ^ a b c d "GSLV Mk. III Launch Vehicle Overview". Spaceflight 101. Wayback Machine. Archived from the original on 11 February 2018. Retrieved 11 February 2018. ^ N. Gopal Raj. "GSLV Mark III faces its first experimental flight". The Hindu. ^ "Why ISRO's New Engine and Mk III Rocket Are Reasons to Forget 1990 Cryogenic Scandal". TheWire. Wayback Machine. Archived from the original on 11 February 2018. Retrieved 11 February 2018. ^ Rajwi, Tiki (2 March 2015). "Semi-cryogenic Engine: ISRO Charting a Revised Plan". New Indian Express. Retrieved 20 May 2018. ^ "ISRO developing heavy lift launch vehicles". The Hindu. 30 May 2015. Retrieved 20 May 2018. ^ "The ISRO Tender Notice With Fascinating New Details of Gaganyaan". Retrieved 29 January 2019. ^ "ISRO eyes kerosene to boost Mk III's lifting power to 6 tonnes". ^ "India launches largest rocket and unmanned capsule". BBC. 8 December 2014. Retrieved 20 May 2018. ^ "ISRO inches closer to manned mission". Timesofindia.indiatimes.com. 10 January 2014. Retrieved 10 January 2014. We will be checking the crew capsule for all parameters. ^ "ISRO's unmanned crew module reaches Chennai". The Hindu. Wayback Machine. Archived from the original on 11 February 2018. Retrieved 11 February 2018. ^ Sangeetha Kandavel. "GSLV Mark III takes to the skies in test flight". The Hindu. ^ "Isro to test GSLV Mk-III, crew module on December 18". The Times of India. Retrieved 11 December 2014. ^ "GSLV Mk III breaks Isro's jinx of failure in debut rocket launches". ^ Clark, Stephen (5 June 2017). "India's launcher fleet gets an upgrade with successful test flight". Spaceflight Now. Retrieved 25 April 2018. ^ "GSLV Mk-III: ISRO successfully test flies its heaviest rocket". The Economic Times. New Delhi. 18 December 2014. Retrieved 18 December 2014. ^ "First Experimental Flight of India's Next Generation Launch Vehicle GSLV Mk-III Successful". 18 December 2014. Archived from the original on 22 December 2014. Retrieved 22 December 2014. ^ "GSLV MkIII to launch Isro's next mission". Hindustan times. 1 July 2014. Retrieved 1 July 2014. ^ "India's GSAT-19 Reaches Geostationary Orbit after Off-Target Injection". Spaceflight101. 10 June 2017. Retrieved 12 February 2018. ^ "GLSV Mark III rocket conducts 'all-up' launch with GSAT-19 satellite". NASA Spaceflight. Wayback Machine. Archived from the original on 11 February 2018. Retrieved 11 February 2018. ^ "Isro successfully launches its monster rocket GSLV Mk III". The Economic Times. Retrieved 11 February 2018. ^ "GSLV Mk III-D1/GSAT-19 Mission - ISRO". www.isro.gov.in. Retrieved 17 June 2017. ^ "Successful Qualification of High Thrust Vikas Engine - ISRO". www.isro.gov.in. Retrieved 18 November 2018. ^ "GSLV F08-GSAT6A Brochure - ISRO". www.isro.gov.in. Retrieved 18 November 2018. ^ "With eye on lunar mission, ISRO to test high-thrust Vikas engine". The New Indian Express. Retrieved 18 November 2018. ^ "ISRO likely to postpone Chandrayaan-2". New Indian Express. Retrieved 9 April 2019. ^ "ISRO to launch 'Chandrayaan- 2' in January 2019; 19 missions planned till March next year". The Financial Express. 28 August 2018. Retrieved 29 August 2018. ^ "Chandrayaan-2 to Be Launched in January 2019, Says ISRO Chief". Gadgets360. NDTV. Press Trust of India. 29 August 2018. ^ "Annual Report 2017-18, Department of Space". ISRO.gov.in. Department of Space, Government of India. Retrieved 13 February 2018. ^ "It's not just an ISRO project, it's a national one: K Sivan". ^ a b Indian Manned Spacecraft. Astronautix. 2014. ^ "India seeks collaborators for a mission to Venus, the neglected planet". Science | AAAS. 21 November 2018. Retrieved 21 November 2018. Wikimedia Commons has media related to Geosynchronous Satellite Launch Vehicle Mark III.